Olives, Spinach and Feta Triangles p28. Lamb, chickpea paste, flat breads. Veg – babaganach? Roasted aubergine and courgettes with tarrato? Cement + orange + parfait – crossed out (I can see why). Grilled courgettes, aubergines with tarater? This person is a planner. They are deciding that some tasks should be done the “day before”. They are referencing page numbers from a cook book, likey from the popular TV host, Nigella Lawson. They likely bank at Barclays, are female, right handed and recycle. This is the first list on www.theshoppinglists.com from the United States. Woo! The list was very kindly donated by Rockie from Portland, Oregan. My guess is that this is a top up shop rather than a large weekly visit. 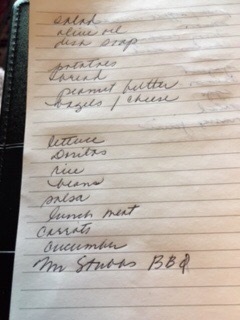 Items on the menu for the next couple of days could include a salad with lettuce, cucumber? Maybe some Mexican food with the rice, beans and salsa and bagels with cream cheese for lunch? Any questions and comments are welcome!